First revealed a year ago, the Razer Blade was a fascinating machine. Dubbed "The World's First True Gaming Laptop" by its makers, the $2,800 17-inch machine, weighing less than seven pounds, was a bold experiment that traded power for portability, and portability for price. The experiment was an overwhelming success. Earlier this year the Blade hit the PC market, garnering mostly favorable reviews. Despite performance that fell short of comparably-priced traditional laptops, the Blade's sleek profile and startling portability drove strong sales — Razer could barely keep up with the demand. And now that Razer has proven the power of the Blade to customers, critics and suppliers, it's time for an upgrade. Meet the new Razer Blade. It's much more powerful, and costs $300 less. During a phone interview conducted in advance of today's big announcement, Razer CEO Min-Liang Tan explained that the new Blade was a direct result of feedback from customers and reviewers that appreciated what the company was trying to do — create a gaming laptop that was truly portable and not just a desktop replacement — but wanted more. We wanted more power, so Razer replaced the original unit's NVIDIA GeForce GT 555M with a GTX 660M and swapped the 2.8GHz Intel Core i7 2640M processor with a third-generation i7 processor so new that Intel hasn't announced it yet. We appreciated the speed of the 250GB solid state drive, but wanted more storage. The new Razer Blade comes with a hybrid drive consisting of a 500GB SATA drive and a 64GB SSD — still much faster than SATA alone. They've upgraded the wireless technology, made the fans quieter, and upgraded the USB ports to a trio of 3.0s with charging capability even when the system is powered off. Looking over my review, Razer has addressed every concern I had about the original unit. Even the innovative but relatively useless Switchblade interface is gaining utility, with an SDK released during Gamescom to ensure developers had the tools required to integrate the customizable LED buttons and touchscreen trackpad into their games. During today's presentation at PAX Prime, developer Red 5 is taking the stage to show off how they've implemented the technology in their free-to-play shooter, Firefall. "With the new Razer Blade, we set out to design something truly phenomenal with extreme performance for gamers in an ultra-thin form factor," said Min. "The design and hardware advancements, combined with our revolutionary user interface, makes the new Razer Blade, without doubt, the very best gaming laptop we've ever designed. The Beauty is now the Beast." One would note that it's only the second one Razer has designed, but still. Perhaps the most impressive problem Razer has solved is the new unit's price tag. 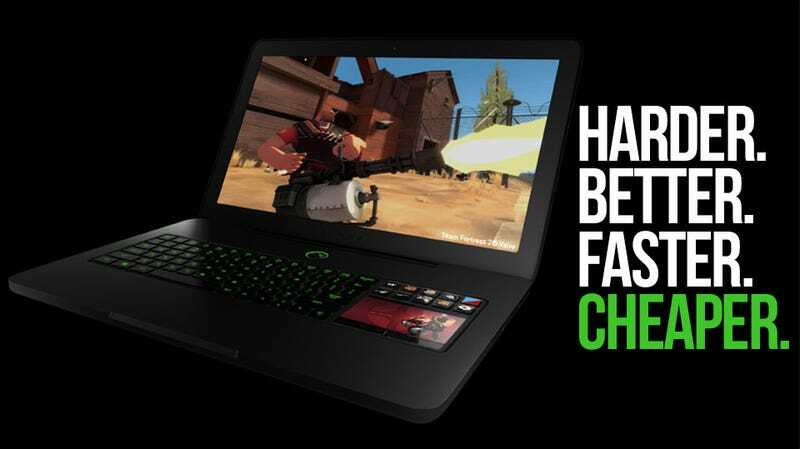 When the original Blade was released, Razer was not in the gaming laptop business. The company had little bargaining power in dealing with component manufacturers, especially with such a unique design. The parts were priced at a premium, and so was the Blade. That's changed now, thanks in large part to the customers and critics that believed in the Blade's vision. The reaction was positive; the sales through the roof, and so now Razer can pass the savings onto the consumer. The new Razer Blade will be up for pre-order on September 2 for $2,499, with units shipping to North American customers by the end of next month (when Intel's new processor is out of embargo). Razer is offering folks that purchased the original unit $500 off, a way of thanking them for making the new machine happen. The original Razer Blade is a marvel of modern PC engineering, the thinnest and lightest dedicated 17-inch gaming laptop ever created. The new Razer Blade is all of that, minus the power compromise. It might not be the future of PC gaming, but it's several more steps in the right direction.